If you have been following my blog for awhile, you'll know I love Feliciano Lopez for his good looks. But I have to give him the thumbs down here for his, er, retarded look (sorry!). Not everyone can look good wearing baseball cap backward. But Nicolas Lapentti can make it look so hot! Fernando Gonzalez has quite a hairy situation here. 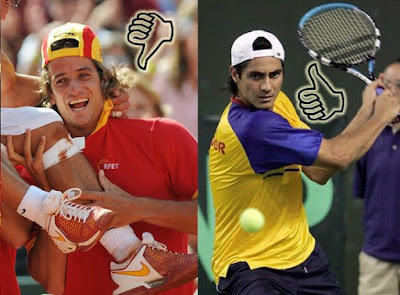 But Juan Martin del Potro's is pretty decent and good enough. 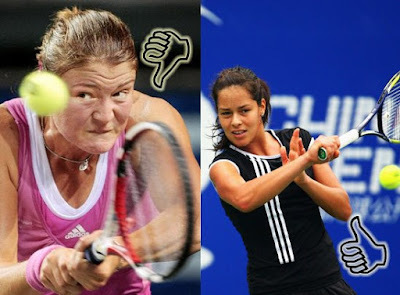 I don't know why Dinara Safina keeps reminding me of the wicked witch in Disney's Snow White and the Seven Drawfs. If only the aspiring world no. 1 soften her facial expression a bit like Ana Ivanovic.